In the previous article, I discussed the revitalization of astrology at the beginning of the twentieth century and, in particular, the impact of a German astrologer, Alfred Witte. Witte’s main contribution to modern astrology is really a process of systematic thinking – discovering and articulating the underlying theories that govern various techniques and expressing them in modern terminology. These ideas are far-reaching and the thought process containing them is profoundly liberating. 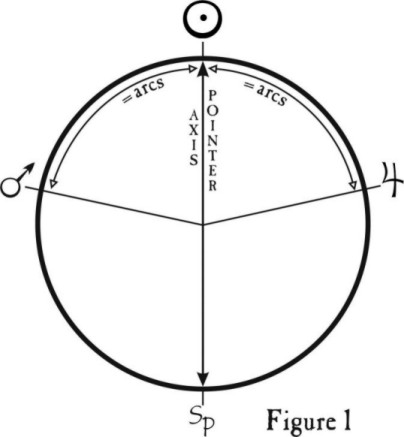 Now we will focus on one of the central features of Witte’s observations, the geometry of the parts that make up a horoscope-- what he called “planetary pictures.” To understand planetary pictures, we must first understand what midpoints are and this is quite easy. When you have a planet standing equally between two other planets, you have an occupied midpoint. 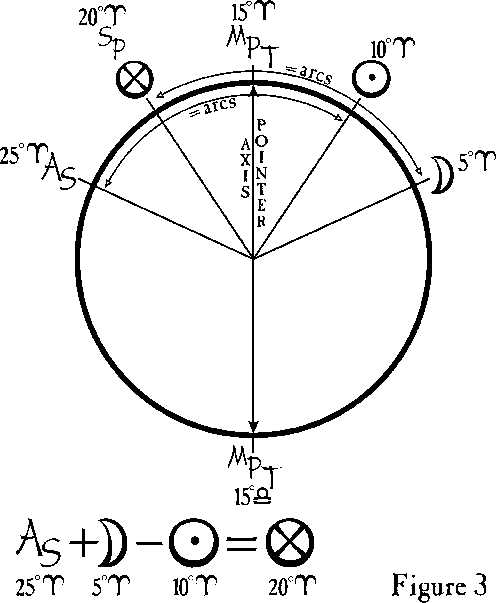 In Figure 1 below, the Sun is occupying the midpoint of Mars and Jupiter. At the bottom of Figure 1 you will also notice a point marked “Sp.” We’ve marked it “Sp” because it is a “sensitive point” -- an unoccupied point that could become meaningful if a planet moves in to occupy it. It is sensitive because it, too, is a midpoint between Mars and Jupiter. Interpreting this midpoint “picture” starts simply and easily. In this case the Sun occupies the point that represents a blend of the energies of Mars and Jupiter. If we consider one meaning of Mars to be “energy” and one of Jupiter’s meanings to be “success,” then an interpretation of the blend of Mars and Jupiter could be “successful energy.” Having the Sun stand exactly on the midpoint between them focuses this “successful energy” through any of the core interpretations of the Sun. For example, if we were to interpret the Sun as “will power,” this picture could indicate someone with the drive, energy and will power to succeed in life. The Sun can also signify “physical body,” and so in the case of an athlete, this picture could describe a person who would have a successful, energetic body designed for winning competitions. A later triggering of the midpoint axis could also show the winning itself. These are simple, two-dimensional interpretations, but they serve to illustrate one way to read and get information from a symmetrical arrangement of planets. Depending on the context of this picture, other interpretations are possible. Is the Sun elevated? Does Jupiter rise in the chart? What other aspects are running with Mars? You could also look at house positions, retrogrades, and more. Such additional considerations put planetary pictures into context and can help you select from a number of possible meanings. However, in our simple illustration, this much is certain: the Sun stands between Mars and Jupiter and expresses the energy of Mars-Jupiter. Even if there are no aspects between these planets, the Sun’s actions become greatly modified through its symmetrical interaction with Mars and Jupiter. A midpoint can be occupied or unoccupied but it is always sensitive. That sensitivity can be triggered in a number of ways -- by a transiting, progressing or directed point, or by a chart factor from another person’s horoscope. Most telling, of course, would be the effect of event charts and other static horoscopes. Indeed, the list is endless. With all these possible factors to look at, you may now be wondering where to look in the chart, what to look for, and whether there is some sort of hierarchy for judging the importance of the different factors. Fear not -- guidelines regarding all of these questions will be given in future articles. In our above illustration, the midpoint of Mars and Jupiter is occupied by the Sun. If this midpoint wasn’t occupied by the Sun (or any other factor), it would be a latent “axis” in the horoscope. When factors, like the Sun, stand in the midpoint, it is considered completed. A midpoint has 2 sensitive points that are opposite each other and the connection of these points is called an axis. Many midpoints can share a common axis, and when they do, we also call them completed planetary pictures. See Figure 2. In Figure 2, above, Mars and Jupiter share a midpoint axis with the Moon and Mercury. Accordingly, our interpretation becomes modified to include all four factors. We could interpret Moon and Mercury to mean many things, for example “public speaking,” or “emotional communications” or “thoughts about feelings” or even “a young girl.” There are many possibilities, and there are even more when we combine the Mars-Jupiter midpoint with the Moon-Mercury midpoint. There is a wide range of possible interpretations, but they center around related themes. Our complex delineations can be built out of simple ideas. Depending on the context, we could interpret the above Mars-Jupiter, Moon-Mercury combination as “success at public speaking” or “the ability to successfully express one’s emotions” or “highly charged emotional thoughts” or “a successful, athletic young girl.” Observation of people and events with these kinds of planetary pictures will confirm your delineation. Last month I talked about the attention that Witte’s teacher, Karl Brandler-Pracht, paid to Arabic parts. An Arabic part is really a type of planetary picture. To see why, let’s look at the most-used Arabic part, the Part of Fortune. As you probably know, the Part of Fortune formula for a daytime birth is Asc + Moon – Sun = Part of Fortune. For example, suppose that the Asc is at 25 degrees Aries, the Moon at 5 degrees Aries, and the Sun at 10 degrees Aries. Since 25 + 5 - 10 = 20, the Part of Fortune would fall at 20 degrees Aries. When you plot these four points on a wheel as in Figure 3, you will see that in fact a planetary picture is formed. Essentially, we are looking at the midpoint of the Asc and Moon. Taking the distance from the midpoint to the Sun and adding it to the opposite side of the midpoint axis gives us the position of the Part of Fortune. This point can be occupied by a natal, progressed or transiting factor, or can be occupied by elements of another horoscope, or it can be completely unoccupied. If it is occupied, then the meaning of the Part of Fortune will become expressed through the particular factor that occupies it. If the Part of Fortune is unoccupied, it remains a sensitive point that can fall in a house and sign whose meaning is significant for the native. In figure 3, there are 2 possible sensitive positions created by this three-planet symmetry. The first sensitive point is the Part of Fortune. The second is the midpoint of the Asc and Moon whose axis is also shared by the midpoint of Sun and Part of Fortune. 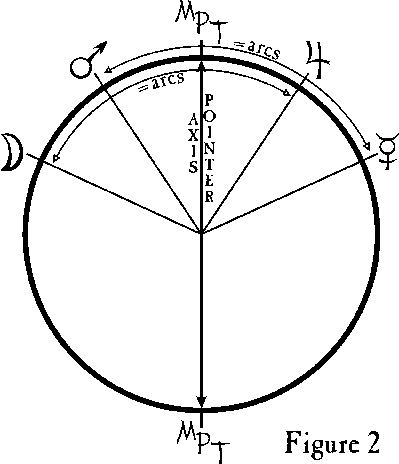 If the Part of Fortune is occupied, then the midpoint axis of the Asc and Moon becomes very powerful because it will connect the Sun to another factor and everything will be on the same axis. If the Part of Fortune is unoccupied, then the midpoint of the Asc and Moon won’t be shared and it will be less influential in the horoscope. If we delineate the 2 sensitive positions created by this planetary picture (using the ideas mentioned earlier in this article) if becomes obvious why symmetrical pictures like the Part of Fortune is so powerful in the horoscope. The combination of the Asc and the Moon connects two primal areas of the life – the native’s view of the environment and their emotional self expression. We call such primal factors “personal points” because they are so integral to the development and manifestation of the self. Having the Part of Fortune sensitive point occupied by a planet adds to the meanings. If the native’s Saturn were to conjoin the Part of Fortune, then the Sun-Saturn midpoint would share the same axis with the Asc-Moon midpoint. Using keywords for all of the points involved, we could say that the native is restricted and experiences obstacles in finding fundamental connections with feelings toward others. Sadly, this would probably make the native’s fortunes difficult. However, with Jupiter in the same position, we could say that the native would find successful physical and spiritual expression of his soul connection or popularity with others. A good fortune indeed!